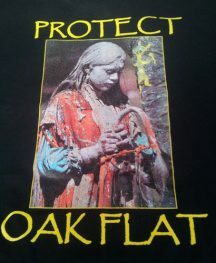 Learn more about the fight to save Chi' Chil Bildagoteel (Oak Flat). The links to the news articles below are just a few of dozens that have been written about the fight to Save Oak Flat from destruction by a foreign owned mining company, Resolution Copper. Endangered Arizona | Arizona Highways Aug 2008 Oak Flat Campground Page 16 "To the Apache, Yavapai, Hopi and O’odham people, Oak Flat Campground near Superior is a spiritually significant part of their ancestral lands....."
Apache leader: Unite to fight proposed copper mine | Arizona Daily Star Jan 31, 2015 "This is not our fight. This is an American Battle." - Wendsler Nosie Sr.